Bryce Harper high-fives teammates after Rhys Hoskins batted him home with a two-run home run in Saturday's spring-training game. 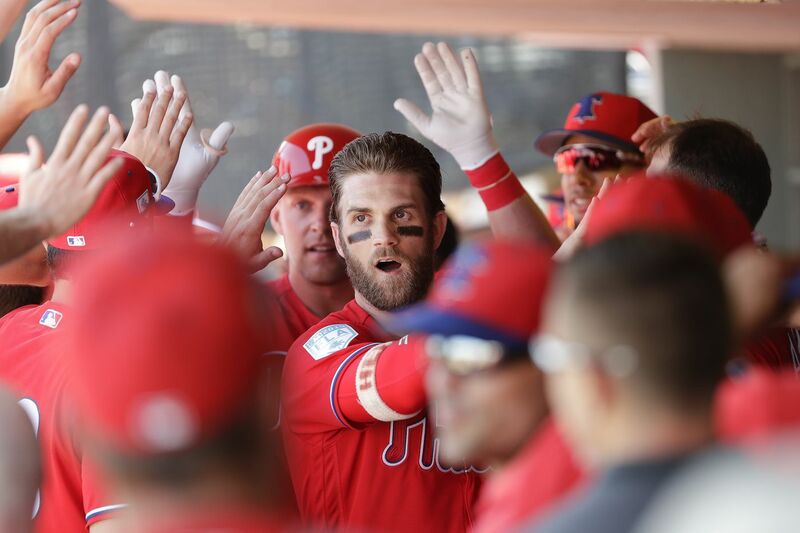 CLEARWATER, Fla. - Bryce Harper touched home plate on Saturday afternoon and lifted his helmet, airing out his flowing hair as the sold-out Spectrum Field roared. The energy of the afternoon, it felt, had built to this moment. A week ago Harper was introduced on top of the dugout. Now he was playing in his first game. The crowd could not get enough. They cheered him during his pregame workout. They rocked when his name was announced in the starting lineup. And they responded with a standing ovation when he walked to the plate for the first time. Forget that the 8-7 loss to Toronto was just another Grapefruit League game. The fans were at a fever pitch all day. Finally — with Harper waiting near home plate — they could explode. Rhys Hoskins, who sent the crowd into a frenzy with a home run that cleared the roof of the tiki bar in left field, stepped on home and greeted the waiting Harper with a fist. Harper’s debut — which consisted of two walks — not only provided the first glimpse on the field of the team’s $330 million superstar, but it provided a glimpse of the offense the Phillies hope they have with him in their lineup. The Phillies, after a busy winter, are a much deeper team than they were last season. Saturday’s first five batters — Andrew McCutchen, Jean Segura, Harper, Hoskins, and J.T. Realmuto — had on-base percentages last season that averaged .360 and slugging percentages that averaged .463. The Phillies should have no trouble reaching base this season and they should have no trouble doing what they struggled so mightily with last season: driving in those who reach base. The first inning was the perfect glimpse. The Phillies could live with Harper walking because Hoskins belted the next pitch for a 400-some-foot homer. The Phillies would love to get used to that. Harper, who will play again Monday, walked to the plate both times to the opening line of Will Smith’s theme from The Fresh Prince of Bel Air. He tried to hit the very first pitch he saw as far as he could but missed it wildly. Harper understands good theater. The crowd booed each time he was walked, believing the pitcher feared their new star. They jeered the Blue Jays for moving their third baseman to left field for a four-man outfield, something Harper hopes does not become the norm. “I got back to the dugout and talked to Larry Bowa about that and said, ‘Have you ever seen that, Larry?’ He said nope,” Harper said. Harper’s debut turned what would have been just another day of spring training into a memorable afternoon. And it may have provided something for the Phillies to get used to. “It feels great,” Harper said. “I walked in and everyone said the pinstripes are slimming so I’ll take that. I’m very excited. Just get out there and put a uniform on and be able to stand on a baseball field again and hear the ovation of running onto the field.